The wonderfully talented Christine Manfield featured on the season finale of MasterChef this year. 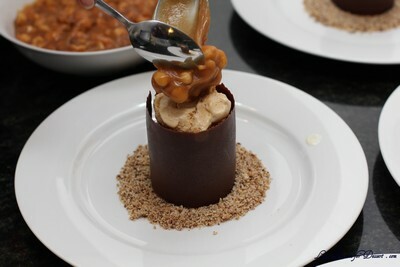 I haven’t watched much MasterChef this year, but I always have to watch for the dessert in the finale. It never ceases to amaze and I always want to make it. I watched the contestants eating the dessert with envy, and couldn’t stop saying – I want that dessert. Straight after the finale, I went searching the internet for the recipe, hoping it was featured in a book or magazine. Luckily it was featured on the MasterChef website the next day, and I set to task planning, buying and cooking. It took me a lot longer to make everything, as I had to cool the ice cream base for most of a day/ overnight before churning. I also had a lot of dishes to wash between making everything. Overall it probably took 1 1/2 – 2 days. It certainly gives you an even greater appreciation for the beautiful desserts made at top end restaurants, and I am feeling excited at the thought of the next hatted restaurant I go to (I have yet to decide where to go). I can’t wait to go to Universal too. I have wanted to go there for dinner for at least a year or two. Maybe I’ll go there. When it comes to this dessert, all I can say is it is wonderful (and quite rich). The components worked beautifully together and it looks gorgeous. I needed to use my 2 ice cream makers twice! The honeycomb ice cream made around 2L of liquid before churning, and the caramel ice cream made a bit over 1L before churning. If you don’t have two ice cream makers, you may prefer to halve the honeycomb recipe, or be ready to mix the ice cream every hour or so in the freezer. 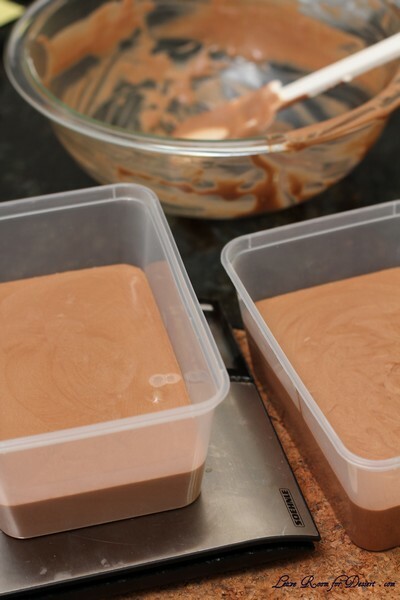 For the ice cream, I filled a 19cm square tin (approx 3-4cm height) for each ice cream. I could not have put the ice cream in half a tin as I think it wouldn’t have held its shape. Even with filling up the two tins, I had ice cream left over. 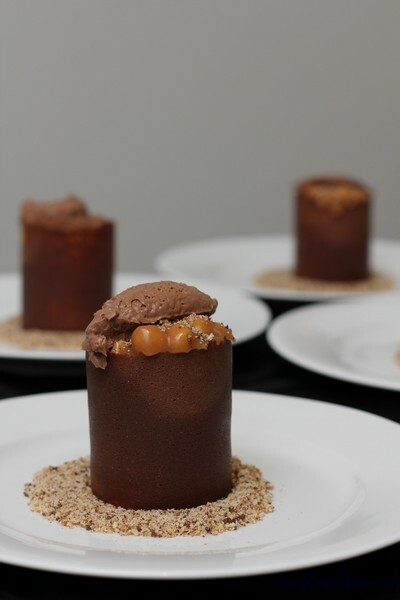 I could not find wafer balls and had to use maltesers and honeycomb balls instead. I did not have access to the 250g Valrhona gianduja hazelnut chocolate, so used 50g nutella + 100g milk chocolate + 100g dark chocolate. (I am sure the Valrhona gianduja hazelnut chocolate would have tasted amazing). 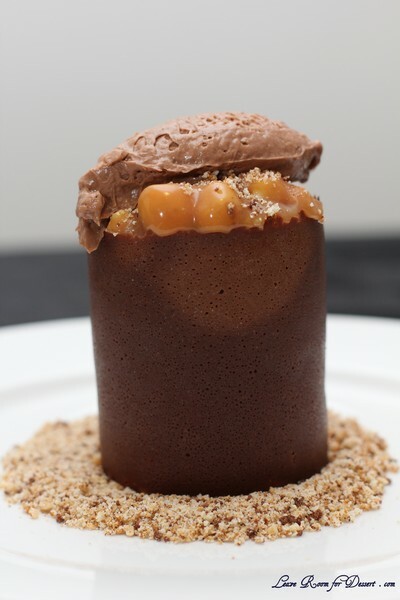 The mousse ended up being quite chocolatey and not very hazelnut-y. I also didn’t have Valrhona Caramelia chocolate, so used some Calebaut chocolate and milk cooking chocolate. I am not sure of the strength of the gelatine leaves I had, so I used 1 1/2 leaves which weighed 6g. I cooked the ice cream bases in the saucepans rather than a bowl over water, as this is how I normally make ice cream. Be careful with the caramel ice cream (I am not sure whether adding some of the ice cream base to the caramel would be a better idea, than adding the caramel to the ice cream base.) When I made it the way it said here, the caramel splattered out of the pot and a little bit landed on my arm. Be careful of your eyes and keep children away from hot caramel as it can cause nasty burns. I made my own template out of paper – it was a bit flimsy though, cardboard might have been better. I needed to sieve quite a lot of the chocolate caramel over the template, and place it in the oven for a while (1-2min) for it to completely melt. Hopefully these tips will help anyone attempting to make this dessert at home. Please enjoy the dessert if you make it, or if you go to Universal! 1. For honeycomb, line a deep large baking tray with baking paper. 2. Place sugar, glucose and water in large saucepan and cook, stirring occasionally over medium heat until sugar dissolves. 3. Bring to the boil, without stirring, then cook until mixture just begins to change colour. Agitate the pan to circulate the colour. You want a very pale yellow colour (as when the bi-carb is added the honeycomb will cook quickly and burn). 4. Remove the pan from the heat, add bi-carb and whisk quickly. Pour into prepared tray and leave to cool. 5. Break into large chunks and store in airtight container until required. 6. For honeycomb ice cream, place cream and milk in a saucepan and bring to a gentle boil. 7. Whisk yolks and sugar in a metal bowl until thicken and pale, gradually pour in hot cream and whisk constantly to combine. 8. Place the bowl over a saucepan of simmering water, ensuring water doesn’t touch the base of the bowl. Cook the custard, stirring with a wooden spoon until mixture coats the back of the spoon. 9. Cool over a bowl of iced water or in a shallow tray in the blast chiller until cold. 10. Pour into a pacojet cannister. N.B. Make sure it is not filled above the safety line. You need to allow room for the ice cream to expand. Place cannister in blast freezer until set solid in the centre, about 1 hour 30 minutes or overnight in a freezer. Churn in pacojet. N.B. Make sure you press the release button before removing from machine or you will damage the machine. If you don’t have a pacojet, churn in an ice-cream machine following manufacturer instructions. 11. Line a 16x25cm base-measurement 3cm-deep slice tin with cling wrap or baking paper. 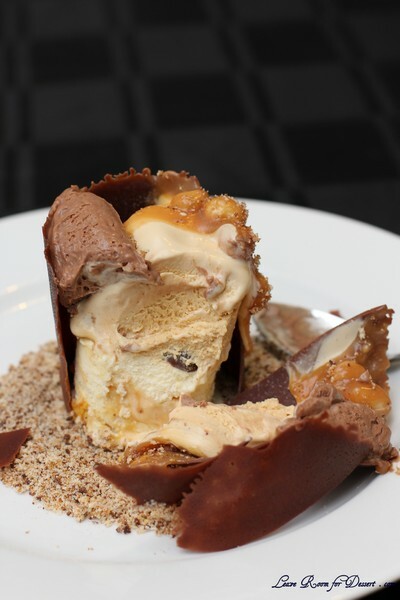 Fold honeycomb through churned ice cream. Spread ice cream into one half of the tin. Make sure you have enough for 4 x 4.5cm disks. The caramel ice cream will fill the other half. 12. Place in blast freezer until firm. When firm, use a round cookie cutter to cut out 4.5cm discs, place on a tray and blast freeze discs until firm. 13. For caramel ice cream, place sugar and water in a saucepan over a medium heat and bring to the boil, agitating occasionally to ensure sugar is dissolved before mixture reaches the boil. Continue to boil until mixture reaches a deep caramel colour. 14. Meanwhile, place cream and milk in a saucepan and bring to a gentle boil. 15. Whisk yolks and sugar in a metal bowl until thicken and pale, gradually pour in hot cream and whisk constantly to combine. 16. Place the bowl over a saucepan of simmering water, ensuring water doesn’t touch the base of the bowl. Cook the custard, stirring with a wooden spoon until mixture coats the back of the spoon. 17. Pour in hot caramel and whisk until smooth and combined. Cool over a bowl of iced water or in a shallow tray in the blast chiller or freezer until cold. 18. Pour into a pacojet cannister. N.B. Make sure it is not filled above the safety line. You need to allow room for the ice cream to expand. Place cannister in blast freezer until set solid in the centre, about 1 hour 30 minutes or overnight in a freezer. Churn in pacojet. N.B. Make sure you press the release button before removing from machine or you will damage the machine. If you don’t have a pacojet churn in an ice-cream machine following manufacturer instructions. 19. Spread into the unfilled half of the 16 x 25cm base measurement 3cm-deep slice tin. Make sure you have enough for 4 x 4.5cm disks. When firm, use a round cookie cutter to cut out 4.5cm discs, place on a tray and blast freeze until firm. 20. For anglaise, to operate thermomix, press time first, then temperature, then speed. Place egg yolks and sugar in thermo jug, set 20 seconds, then speed 7. 21. Add cream and milk, and set for 7.5 minutes, then 80°C button and then speed 4. Light will stop flashing once anglaise comes up to temperature. 22. 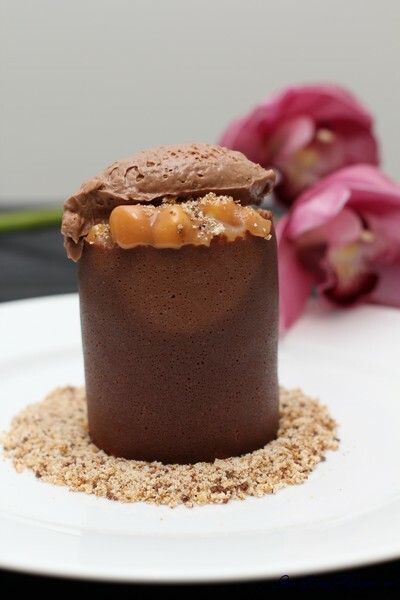 For hazelnut chocolate mousse, pour 80°C base anglaise into a large metal bowl, add softened gelatine, stirring to dissolve the gelatine, then cool over ice to 45°C. 23. While anglaise is cooling, place chocolate in a metal bowl over water bath and heat to 45°C. 24. Fold melted chocolate through anglaise until combined. Cool completely over a bowl of iced water, fold in whipped cream. 25. 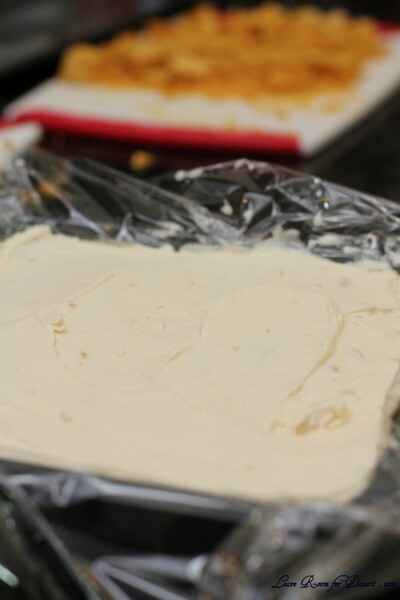 Divide into 2 plastic rectangle containers and refrigerate until firm. Do not blast freeze as it weakens the gelatine structure. 26. For hazelnut caramel, place cream, glucose and vanilla bean in a saucepan over a medium heat until simmering. 27. Make a dry caramel by melting sugar in a deep frying pan over a medium heat. Bring to the boil, and continue to cook, agitating the pan occasionally until sugar reaches a caramel colour. 28. 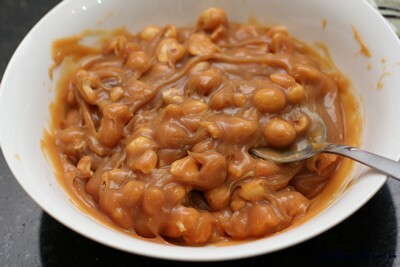 Pour in warmed cream mixture, stir to combine and cook for 5 minutes until caramel dissolves. 29. Add butter and stir to combine. Remove from heat and cool, stirring occasionally. 30. To serve, combine a few tablespoons of chopped nuts with a few tablespoons of caramel and season with vanilla salt to taste. 31. For chocolate collar wafers, preheat oven to 200°C. Place a silver oven tray upside down in oven and allow to become very hot. 32. Place fondant sugar and glucose in a saucepan and cook to 180°C. 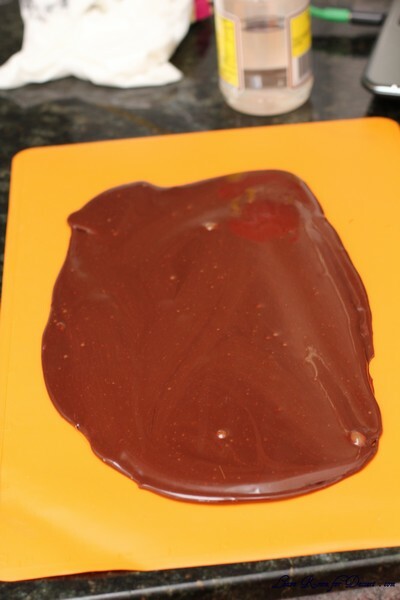 Add chocolate and mix until smooth, making a homogenous paste. Spread onto a silicone mat, roll to 5mm thick with a silicone rolling pin and leave to cool. 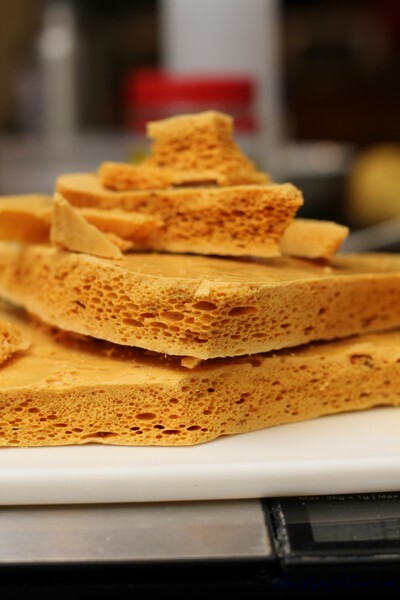 Break set toffee into pieces and transfer to a bowl. 33. Take 1/3 of toffee and place in a mortar and pestle. Pound to rough 1cm pieces and transfer to a thermo mix or blender. Blitz to a fine powder. Tap jug on a bench to loosen and blitz for a further 10-15 seconds. 34. Spoon some of the powder into a fine sieve, place a rectangular 20 x 7.5cm stencil over a silicone mat on a flat baking tray that has one end open for easy transfer. Sieve mixture over stencil to 1-2mm thick. The powder should just be level with the thickness of the stencil. 35. Place one finger at one end of the stencil to keep in place and gently lift the opposite end, ensuring not to indent the powder. Lift the stencil away completely. 36. Take the upside down oven tray from the oven and place upside down on a flat bench. 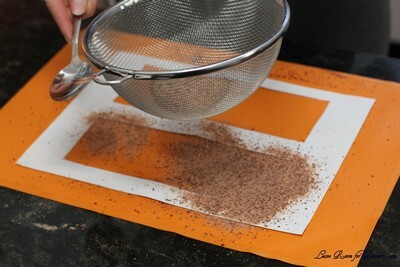 Gently slide the powder-covered mat onto the tray and allow powder to melt completely, this will take 60-90 seconds. If the powder doesn’t melt together completely place in the oven for 15-30 seconds. 37. Run a small crank spatula over the wafer to check consistency. You want it to be set and cool enough to be pliable and easy to roll but not hot enough that it stretches easily. 38. Lift up one end by gently flicking it with the spatula, lay a 5.5cm base-diameter squeezy bottle over hot wafer and roll up around the bottle. Gently press the join to the hot mat to seal and gently ease off the bottle. Repeat until you have the desired amount of wafer cylinders. 39. For gaytime dust, blitz together to a fine crumb. 1. Place a spoonful of gaytime dust in the centre of a serving plate and flatten a central circle large enough to fit the chocolate collar wafer. 2. 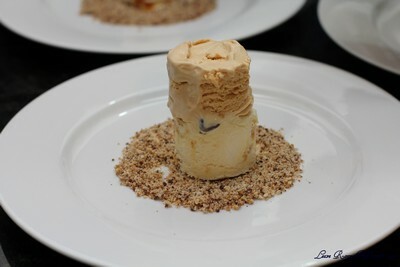 Take a round of honeycomb ice cream and place it in the centre. 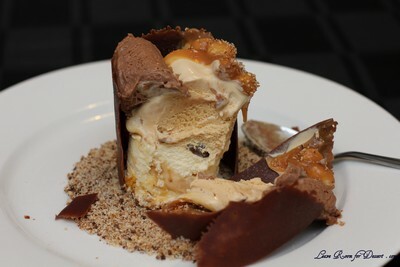 Dip the caramel ice cream in the chocolate wafer balls and place on top. 3. 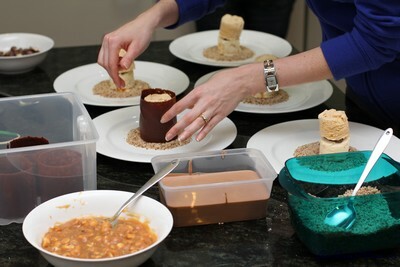 Gently ease the chocolate wafer collar over the ice cream to encase and fill with a little bit more ice cream if required to bring it to 1cm below the top of the collar. 4. Combine the hazelnuts and caramel and season to taste with vanilla salt. Spoon on to the ice cream to cover and bring to the top of the collar. 5. 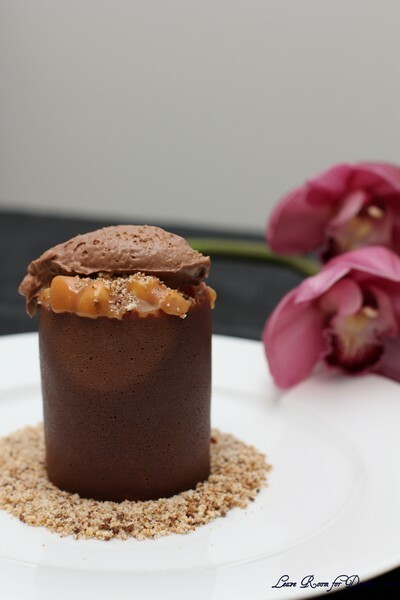 Place a spoonful of gay time dust over the caramel and top with a quenelle of mousse. There are some things you never even consider making. For some this may be ice cream, marshmallow, nougat or maybe a crouquembouche. 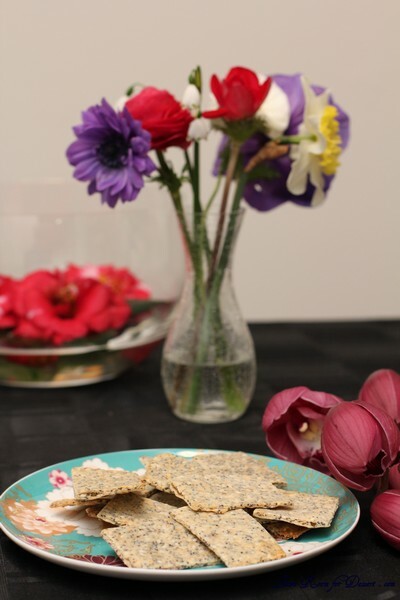 I didn’t realise until this month, that I had never thought of making crackers before. 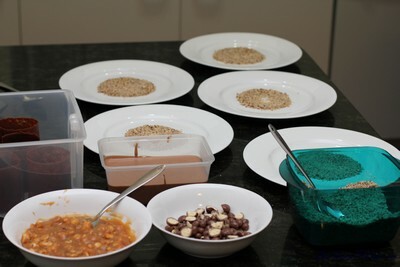 Whilst making the crackers or seedy crisps, I wasn’t sure how they would turn out. I couldn’t imagine their taste. When the first taste was taken, I understood why this challenge was chosen. When everyone else tried these crisps, they were gobbled up quite quickly, with brie and dips. There was a lot of suggestion to make it again, possibly to serve it with the spinach dip. Thanks Dana for a wonderful challenge I never expected. Recipe Source: Brown, Alton (2011). 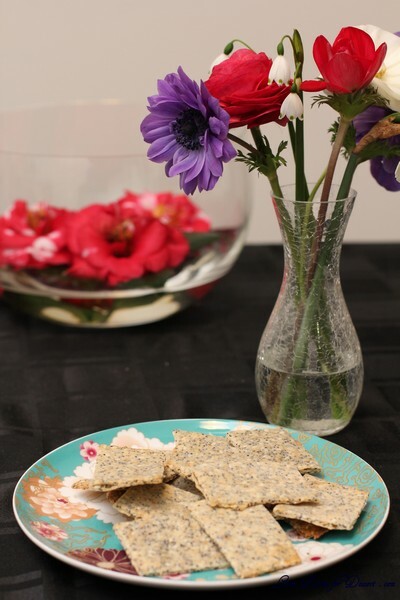 Good Eats 3:The Early Years, “Seedy Crisps”. Stewart, Tabori & Chang, New York, NY. 5. Preheat the oven to hot 450°F/230°C/gas mark 8. 6. Working with a quarter of the dough at a time, either use a rolling pin to reach a desired thickness (thick or thin) or roll out in your pasta rollers. If you use pasta rollers, ensure the dough is well-floured so as not to stick. 8. 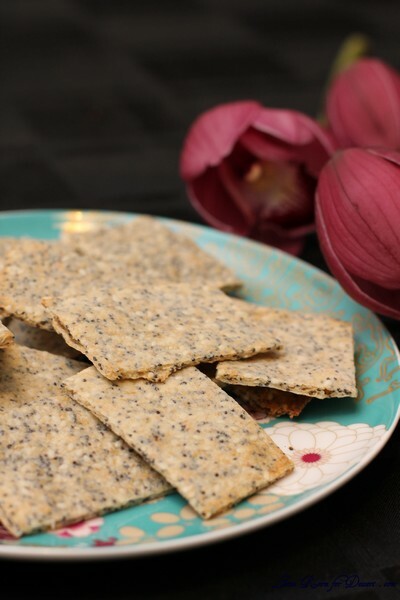 If the crackers are thick, bake for 7minutes, flip them over and bake for 7 minutes more. 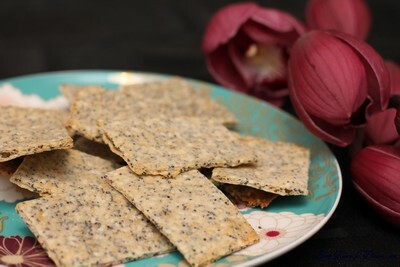 Then cut or break into crackers shapes while still warm. Return to the oven for a further 5 minutes until crispy.